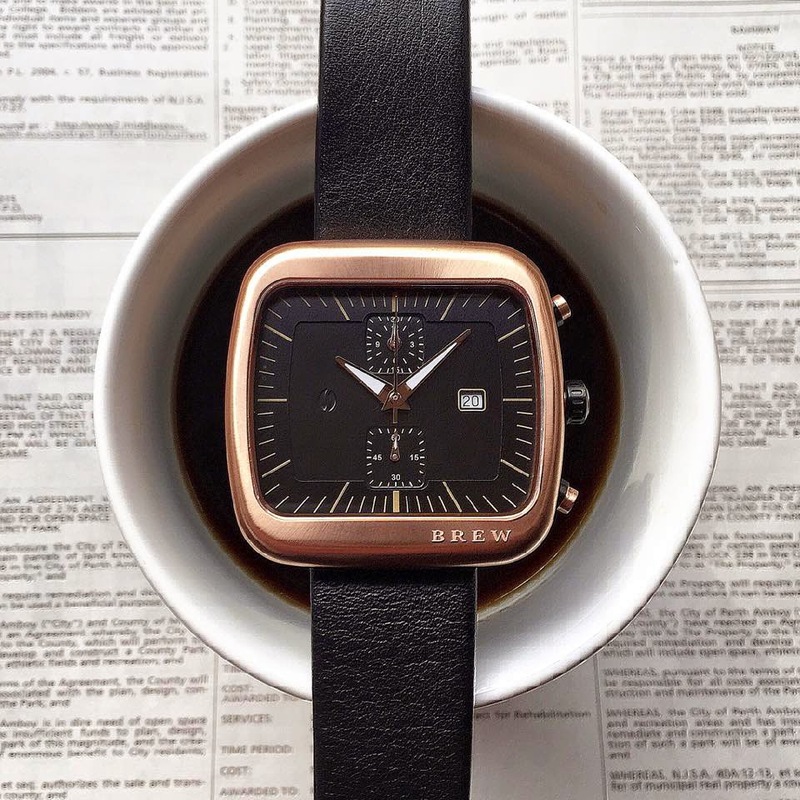 Next month, the Brew Watch Company will launch their collection on Kickstarter. As you may have gathered, the watches were inspired by coffee, thereby merging two things The Time Bum cannot function without. The design draws heavily from industrial espresso machines, and features a variety of brushing techniques, warm colors, and channeled sides that recall steam vents. The lugless case is 44mm square and 11mm thick. It is composed of 316L stainless and offered in three versions: PVD rose gold or black with a black dial, and brushed steel with a cream dial. A flat sapphire crystal tops it off. The leather strap is 22mm wide. Movement is a Ronda 3520.D two register chronograph with a date. Water resistance is 5 ATM. Pre orders will be $275, retail will be $375. I've only seen photos, but so far I like where this is going. I appreciate the uncluttered dial with its embossed bean logo, the engraved Brew brand name on the case, and the fact that it does not look like every other watch. The case shape is particularly appealing. That's the Bum's take. What's yours? I hope to have a more complete review in the coming weeks, but for now, Brew has asked for my reader's feedback, so let 'em have it. Do you like it? Would you change it? Do you prefer decaf? Leave your comments below. Photo courtesy of Brew Watch Co.